Citation: Henok A. Knowledge and Practice towards Prevention and Control of Malaria in Tepi Town, Sheka Zone, Southwestern Ethiopia. Health Sci J. 2015, 10:1. Background: Malaria is an entirely preventable and treatable mosquito borne illness which has been causing millions of deaths around the world, more than 90% of them being in Sub Saharan Africa. Even though much has been done to decrease this incidence, it still continues to be a disaster especially to the poor. Objective: To assess the knowledge, and practice towards prevention and control of malaria in Tepi town, Sheka zone, Southwestern Ethiopia. Methods: A community based cross-sectional study design was used and 249 samples were selected by systematic random sampling method. A questionnaire was prepared to assess the socio demographic characteristics, knowledge, and practice towards malaria prevention and control. The data was analyzed and presented using tables and figures. Result: The study reveals that all respondents had heard about malaria. Fever, headache and chills/rigor were the commonest symptoms mentioned by the community (88.8%), (75.5%) and (73.5%) respectively. Bed net (83.1%) and draining stagnant water (77.5%) were mentioned as a preventive method of malaria. Only 69.9% respondents use bed net and 62% drain stagnant water in their surroundings. Conclusion: The communities’ awareness on means of transmission and ways of prevention of malaria seems to be good. However, the bed net ownership and utilization was not as high as their knowledge. Concerned bodies are recommended to disseminate bed nets, treat old bed nets with insecticide. Malaria remains a major global public health problem and development challenge. It is an entirely preventable and treatable mosquito borne illness [1-3]. The diseases are also responsible for huge economic losses; both in terms of health-care costs and lost productivity, mostly in countries that can least afford them [2,4,5]. Despite currently available interventions, malaria remains a major public health problem. Worldwide, an estimated 3.4 billion people are at risk of malaria, of which 1.2 billion are at high risk. In high risk areas, more than one malaria case occurs per every 1000 population . There were an estimated 207 million cases of malaria and an estimated 627,000 deaths worldwide in 2012. From which, more than 80% of the cases and 90% of all deaths occur in sub-Saharan Africa, and 77% occur in children under five years of age [1,4]. In Ethiopia, it is also a leading health problem with two-third of the population lives in the place where malaria transmission is high. All members of the population are at risk of severe disease due to high malaria transmission from frequent and often large epidemics as a result of unstable pattern of the disease leading to low immunity in the community . The main malaria control strategies in Ethiopia include selective vector control, epidemic management and control, environmental management and personal protection through the use of ITNs (Insecticide Treated Nets) . Studies indicated that despite these bitter facts, communities are not well aware of the multidimensional challenges of malaria in our country. The knowledge of the community is far from perfect, and misconceptions are rampant . There have been a considerable number of reports about knowledge, attitude, and practice relating to malaria and its control from different parts of Ethiopia. These reports concluded that misconceptions concerning malaria still exist and that practices for the control of malaria have been unsatisfactory [4,5]. The available technical prevention techniques can be grouped into personal (repellants, protective clothing’s, mosquito nets, aerosols etc), disease or transmission control (chemical insecticides, IRS, etc...) and biological control (bactericides, larvivorous fish,) which have all resulted in tremendous change in most part of the victim world countries including Ethiopia . In Ethiopia, as one of SSA countries malaria also remains one of the most public health problems despite considerable effort made to control it [4,5,7]. The Federal democratic Republic of Ethiopia Ministry of Health estimated that there are more than 5 million clinical cases and thousands of deaths due to malaria each year . Approximately 75% of the land mass where 68% of the population being at risk of malaria infection with a seasonal and unstable transmission and epidemic occurring every five to eight years [5,7]. The major malaria targets of the Ministry of Health are a 100% household coverage of:- two ITNs per household in all malarious areas and making more than 85% of the population in epidemic prone areas covered with IRS and above 80% of the population have access to prompt and effective treatment with ACT . While few studies, have been conducted in the country regarding the issue of knowledge, attitude and practice towards malaria prevention and control strategies [4,5,9]. However, there is a need to focus in this type of studies locally, since the political, cultural and socioeconomic conditions and access to health services might differ among regions. This study will increase the availability of data necessary to support and guide the new malaria control policies regionally and will be helpful to institute appropriate preventive and control measures. Therefore, community based cross sectional study was carried out to assess the level of awareness or knowledge, attitude and practice of prevention and control of malaria in Tepi town, Sheka Zone, Southwestern Ethiopia. The finding from the study will give important information about the malaria prevention and control methods for the community. The study was conducted at Tepi town, which is the capital town of Yeki woreda, Sheka Zone, Southwest Ethiopia, 609 km far from Addis Ababa. The study was conducted in July, 2014. A community based cross-sectional study design was employed to assess knowledge, attitude and practice of community towards prevention and control of malaria at Tepi town. All households found in Tepi town were considered as source populations of the study. All permanent dwellers and who stayed for more than 6 month were included in the study. The sample size was determined by using single population proportion formula (P=0.81(proportion of population who had good practice towards malaria prevention in Bench Maji Zone, 2006)) using 95% confidence interval and margin of error 5%. Systematic sampling technique was used to select households. List of the households was used as sampling frame. Structured questionnaire was used to collect information regarding socio demographic characteristics and knowledge, attitude and practice of prevention and control of malaria. Face to face interview was used. Data collectors were trained on data collection. Data collection was supervised by principal investigators. To control the quality of the data questionnaires were cross checked at the end of the day. The data was entered in to Epidata and exported to SPSS for statistical analysis. Data was presented by using different figures and tables. We had a legal permission paper from department of public health of Mizan-Tepi University. The study participants were informed about the purpose of the study and that they have the right not to participate in the study. The confidentiality and privacy the participants was maintained. The interview was started after verbal consent. To a knowledge related question, if >60% of respondents answer correctly, then they are knowledgeable to that question. If >60% of respondents react to attitude related question accordingly, then they have positive attitude on that question. If >60% of respondents have practice to practice related question, then they have good practice for that practice question. A total of 249 (100% response rate) individuals were included in the study. The participants’ mean age is 29.3 years. Out of 249 study participant, 207 (83.1%) were females and the remaining 42 (16.9%) were males. Most of study participants 183 (73.5%) were married. About 26.5% of the total individuals’ last completed class was between 9th and 12th grade. Majority of the households 160(64.3%) included in the study were orthodox religion followers. A major percentage of the participants are Amhara 94(37.8%) by ethnicity and merchant 47 (18.9%) by occupation (Table 1). Table 1: Socio demographic characteristics of respondents in Tepi town, Sheka Zone, Southwestern Ethiopia, 2014. In this study, all of the participants had heard about malaria i.e. 249 (100%). 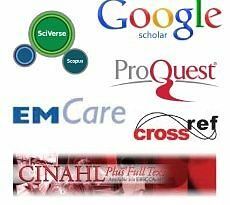 Regarding source of information for participants, about 96(38.6%) of the respondents have gained the information from health facility, 47(19%) of the participants’ source was school (Figure 1). 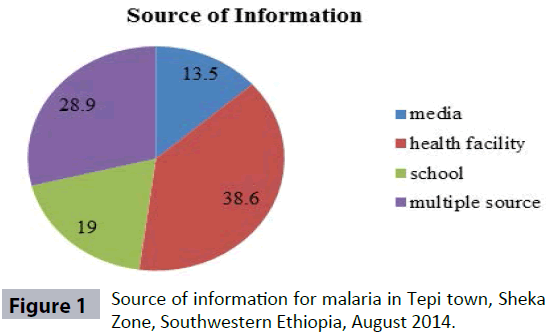 Figure 1: Source of information for malaria in Tepi town, Sheka Zone, Southwestern Ethiopia, August 2014. In this study, respondents are knowledgeable on symptoms of malaria (234(94%) of the participants know the symptoms of malaria). Fever was the mostly mentioned symptom 102(88.8%). chills and rigor, and headache follow with (33%) and (18%) respectively. Respondents who knew multiple symptoms were 41(16.5%). About 99(39.8%) don’t know what the severity signs are (Table 2). Table 2: Knowledge of respondents about symptoms of malaria in Tepi town, Sheka Zone, Southwestern Ethiopia, August 2014. About 216(86.7%) of the participants knew that malaria is a transmittable disease. All of them mentioned mosquito bite as a means of transmission. One third 33(13.3%), 24(9.6%), and 5(2%) added hunger, exposure to cold and lack of personal hygiene as cause of disease respectively. About 235(94.4%) of the interviewed population believed that malaria is preventable. As the graph below shows most of the respondents 208(83.4) mentioned using bed net and 193(77.5%) mentioned draining of stagnant water as a means of prevention. Others also mentioned wire mesh at windows 38(15.3%) and wearing long cloths 28(11.2%) (Figure 2). Figure 2: Knowledge of respondents’ on methods of prevention of malaria of Tepi residents Sheka zone, South western Ethiopia, 2014. As the study shows, 174(69.9%) of households have used bed net and 113(65%) still using it. Of those who are not currently using bed net, 192(77%) mentioned lack of access, 20(8%) lack of awareness, and 37(15%) mentioned other reasons. Of those who are currently using bed net, only 24(21%) said that it has been retreated. As the table presents, about 99(39.8%) of the samples have noticed stagnant water in their surroundings. But only 61(62%) of them have tried to drain it. The table shows that the main cause of not draining stagnant water is, not knowing negative consequence of it(61%), followed by lack of awareness , lack of time and have no importance, each accounting for (13%). Majority of individuals 202(81.1%) don’t spray DDT at home. And their reasons for spraying were lack of access 166(66.7%), lack of awareness 71(28.6%) and fear of side effects 12(4.7%). The table below shows that only 38(15.3%) of the houses were sprayed with insecticide in the last 12 months, but 160(64.3%) of the house hold screen their window early at night to prevent insect bite. Almost all 221(88.8%) of the houses don’t have holes for the entry of insects (Table 3). Table 3: The participants practice of spraying DDT, screening window and presence of a hole in the wall of the house Tepi town, Sheka, South western Ethiopia, 2014. Community knowledge on malaria prevention and control options is important and the effort is related to either to environmental management, personal protection or vector control. This study revealed that all respondents i.e. 249 (100%) had heard about malaria, which is higher than the study made in Kersa (Eastern part of Ethiopia) (85.9%) . This study indicated that 216 (86.7%) of the respondents were aware that malaria is transmitted by bite of mosquito which is lower than the study made in Arba Minch, Ethiopia which revealed that (98.2%) of them knew that mosquito bite transmits malaria . However, this study subject’s knowledge about the means of transmission of malaria is much better than other study made in Amhara region, Ethiopia which is 32.3% revealed mosquito bite for transmission of malaria . Most of the community members get the information about malaria from health facility (38.6%) followed by multiple sources, school and media (28.9%, 19% and 13.5%) respectively. Fever, chills/rigor and loss of appetite are commonest symptoms mentioned by the community (41%), (13.3%) and (12.8%) respectively. This is comparable with study made in Arba Minch . From the study most the community members know that malaria is preventable which is comparable with the study done in Amhara region [11-14]. Bed net and draining stagnant water (83.1%) and (77.5%) respectively are mentioned by the community as a preventive method was relatively similar with the study done in Arbaminch (84.6%) and (72.3%) respectively . From the study, most of the community members were aware that the mosquito breeds in stagnant water which is (96.4%) which is higher than the study conducted in Amhara region (72.6%) . From the study made, most of the community members were aware that under 5 children are more affected (85.1%) followed by pregnant mothers (62.3%) which wass comparable with that of the study done in Tanzania . From the study most of the communities give priority for using bed net for both pregnants and children (50.7%) followed by all members (18.9%) which is relatively similar with the study done in Tanzania . Remaining (13.3%, 9.9% and 7.2% ) give priority to parents, children and pregnants respectively. In this study, although majority of the respondents were aware about preventive methods of malaria, only (69.9%) respondents use bed net which was far less (91%) from the study done in Tanzania . From this (65%) were using bed nets still currently. And the remaining (35%) reported that they are not lucky to use it now due to reasons like lack of access (77%), lack of awareness (8%) and other reason (15%). It shows that it is still far less from Ethiopian MOH aims (93% of total population to own bed net and 55% to have access to IRS) . But it is similar (65.6%) to a survey made in Ethiopia in 2007 . In this study, 100% of the respondents’ bed net had never been treated with chemicals. The low utilization of bed net and IRS may be due to the preference of the health bureau about malaria prevention programs to the rural community and unfortunately the kebeles of Tepi town are urban kebeles. In addition to this, there seems to be shortage of materials like; bed nets in the town. There is fairly distributed stagnant rain water in around 40% of the communities. Even if (62%) of the community take the action, it become difficult to control due to seasonal and geographic reasons. 38% of the communities doesn’t take any action, due to lack of awareness and time and without knowing the negative consequences. Most of the community didn’t spray DDT (81.1%). This is due to lack of access to buy DDT and lack of provision by government or NGO. Among the households (18.9%) who spray DDT, (15.3%) spray in the last 12 months which is less than the study done in Shewa Robit (70.4%) . (64.3%) of respondents screen their windows early at night and (11.2%) of the respondents’ house has hole. The communities’ awareness on means of transmission, when mosquito bites and where it breeds, treatments and ways of prevention of malaria seems to be good. However, the bed net ownership and utilization of the society is not as high as their knowledge (69.9%). Concerned bodies are recommended to disseminate bed nets, treat old bed nets with insecticide chemicals. World Health Organization, World Malaria Report, Geneva, world health organization, 2013. Country profile president malaria initiative, Ethiopia April, 2013. Fmoh Fdre AA (2004) Guideline for malaria epidemic prevention and control in Ethiopia 2nd edition. Aderaw Z, Gedefaw M (2013) Knowledge attitte and practice of community towards malaria prevention and control options in ant- malaria association in intervention zone of Amhara region, Ethipia. J. Trop Dis. 1: 118. Abate A, Degareg A, Erko B(2013) Community knowledge, attitude and practice about malaria in low endemic setting of Shewa Robit. BMC 13: 312. Ethiopian national vector control program strategies FDRE, MOH (2011- 2015). FDRE(2007) Ethiopian national malaria indicator survey. MOH. MOH (2011) Malaria program performance review. Astatkie A (2010) Knowledge and practice of malaria prevention methods among residents of arba minch town and arba minch zuria district, southern ethiopia. Ethiop J Health Sci 20: 185-193. Gobena T, Berhane Y, Worku A (2013) Women's knowledge and perceptions of malaria and use of malaria vector control interventions in Kersa, Eastern Ethiopia. Glob Health Action 6: 20461. Tanzania HIV/AIDS and malaria indicator survey 2011-12. Tsuang A, Lines J, Hanson K (2010) Which family members use the best nets? An analysis of the condition of mosquito nets and their distribution within households in Tanzania. Malar J 9: 211. Jima D, Getachew A, Bilak H, Steketee RW, Emerson PM, et al. (2010) Malaria indicator survey 2007, Ethiopia: coverage and use of major malaria prevention and control interventions. Malar J 9 : 58.